Are you ready to have a ball celebrating a 2-year-old's birthday? This adorable seal is! 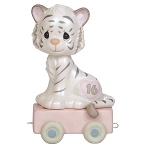 Part of the Precious Moments Birthday Train, this piece attaches to other figurines in the series, celebrating all the wonderful birthdays a little one enjoys, from birth through age 16. Resin. 4” H.